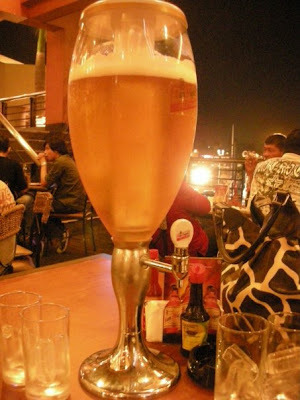 - city girl diaries -: The NEW Beer Tower! This is the new beer tower in Gerry's Grill at Greenhills. Well I haven't checked out its other branches yet to see if they're using the same thing. According to the waiter, it contains about 8-10 bottles of beer. The center tube inside is where the ice cubes are placed to keep the beer cold.